Here you'll find a series of short tips that make Instinctive Notes even easier to use. The Instinctive Notes App uses 'Pull to Refresh' for on demand updating of appointments or clinical notes. Simply hold your finger on the Appointment, No Notes, Draft Visits or Client History lists and pull down until you see the words "Refreshing Data" appear at the top of the list. The standard Apple "Pull to Refresh" requires a a reasonable pull, so make sure you pull down far enough. At this point you will receive the most up to date information for the particular list you are refreshing. The Diversified and Gonstead code templates have a smart double tap function to allow more codes to fit into screen. For the Diversified codes template all codes are able to record either Posterior and Anterior adjustments. A single tap to any code will select the Posterior version, for example L5LP below. A double tap to any code will select the Anterior version, for example C1RA below. Tapping a selected code again, whether Posterior or Anterior, will unselect it. The Gonstead codes template is designed to follow the spine from top to bottom. Not all codes are double tap relevant, so an underline is set for any code which can be double tapped. Smart double tap has different effects depending on the code, in some cases it will change Anterior to Posterior, see PSLSLP below, and in other cases it will change Superior to Inferior, see C1AS below. The Instinctive Notes App can store a client level note that is shown at the top of the Client History screen at all times. This note is useful for storing information that you need to remember every time you see a client. It is particularly useful to record the main reason for treatment or any medical alerts. Generally the client note is coloured yellow to highlight it against the list of previous clinical notes for a client. 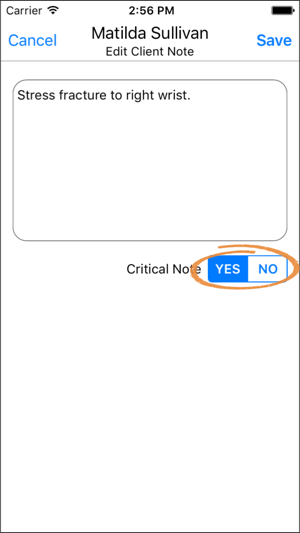 A special "Critical Note" status can be set for the client note to indicate a important detail. This will turn the client note red on the Client History screen to indicate the importance. The Instinctive Notes App recognises that client treatments often follows patterns so to reduce note taking time the codes from a client's previous note are copied to the new note. You can then easily alter the one or two codes which have changed for the new note using the standard codes screen. There may be cases where a client's treatment is very different from their last visit and copying codes actually slows down the note taking process. In these cases you can simply swipe from right to left on the "Adjustment Details" section of the Note Overview to clear all of them in one go. Alternatively, you can remove copied codes one at a time from the methods screen. Simply tap the "+" next to the codes on the overview screen and then swipe left on any code in the list to remove that code. Occasionally you may need to take a clinical note when there is no appointment on your list. The most likely reason would be due to a failure in either the Instinctive Notes service or an integration partner (like Cliniko) which meant that Instinctive Notes App could not receive appointment updates. Taking a note without an appointment is easy. Tap the "More" tab to access additional iNotes features and select the "Your Clients" option. Here you will find a list of all the clients stored in the Instinctive Notes App. You can easily search for a specific client before selecting them. Once a client is selected you will be in the familiar Client History screen where you can add a new clinical note with the "+" button. These notes are exactly the same as a standard note, only not linked to an appointment. We don't recommend using this approach unless absolutely necessary as it will break the link to the appointment and will be missing appointment type information. Also in the "More" section, "Refresh all Clients" does exactly that, it refreshes all client information to iNotes. If you are unable to find a client you expect in the client list then use "Refresh all Clients" to ensure all the client information is up to date. If the Instinctive Notes App is not behaving as expected or appointments are not appearing then you can "Reset Data" which you can find in the "More" tab. This option is not expected to be used in normal operation of the Instinctive Notes App. If you find yourself having to use this more than once or twice please contact us at the support email below as there may be a bug. So now you are armed with a series of tips to use in your daily note taking. As always you can check out our other support resources or contact our support team if you have further questions.